Procedural generation is something that can be tough to balance when developing a game; too much reliance on it can make for a game that feels insincere, like it was artificially churned out by an algorithm, while too little can often extend the development time considerably to reach a product of the same relative value. 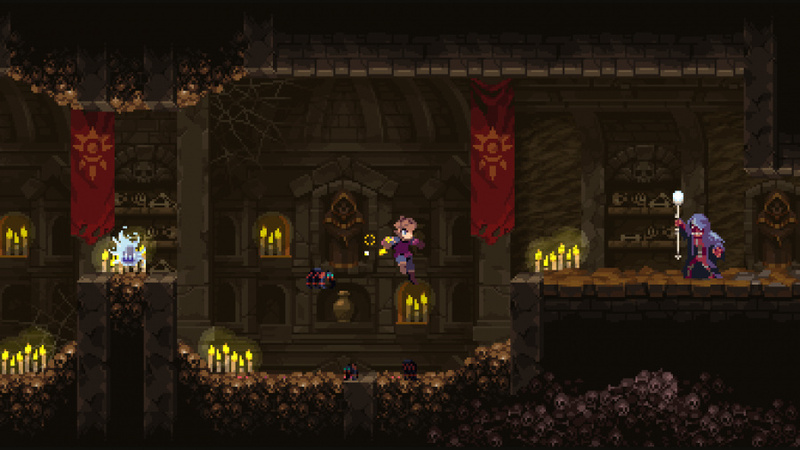 Chasm aims to find that well-fitted balancing point in how it ‘randomly’ constructs a Metroidvania world, and largely succeeds in this endeavour, along with expertly copying the ideas of previous masterpieces in the genre. The tradeoff is that it lacks a certain degree of originality, amounting to a fun but somewhat forgettable adventure. The story opens with you taking control of a nameless recruit in the Guildean army, dispatched on a mission to a mining town that has mysteriously ceased producing materials. Upon arriving there, you find a ghost town and learn that all the townspeople were carried off into the nearby mine by monsters. At first, the mine appears to be just a mine, but probing deeper soon reveals there’s much more to it as you uncover the remains of an ancient civilization that worshipped a demon king named Ulak. The narrative here is mostly told through a series of journal pages you occasionally find as you explore, and while there’s nothing groundbreaking or particularly emotional about this plot, it possesses a fitting amount of mystique to keep you wanting to know what’s going to happen next. 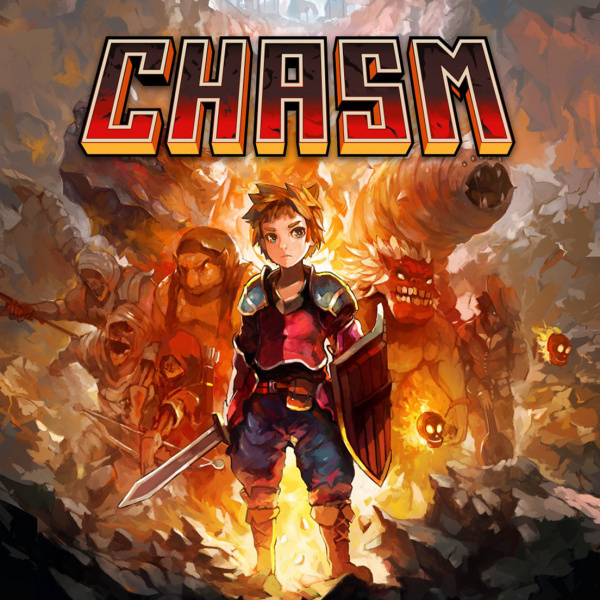 Chasm’s claim to fame is that the world is entirely created through procedural generation, with each run through the campaign being more or less a completely unique experience. Elements such as certain plot points and item locations are kept static from game to game, but the connective rooms that make up the majority of the experience are handled via an algorithm that stitches them together. A key thing to realize here is that the room designs themselves are not random; each one has been carefully designed by the developers, it’s simply the order in which you encounter them that’s randomised. The problem with this approach is that it stumbles a bit in some places with the pacing; there’s a relatively sparse number of collectables to find on the journey, which can make for long sections that feel rather boring once you’ve gotten the hang of combat. There were several points along our run in which it felt like progress was quite sluggish, as we went from forgettable room to room fighting the same handful of enemies with little in the way of secrets or puzzles to break things up. It doesn’t help that the handful of permanent upgrade items that you do find seldom feel useful outside of a few sparse examples in which the ability is needed to get past an obstacle. This disconnect in the integration of map design with your ability set creates a sense of stagnation, as you’re essentially doing the exact same stuff eight hours in as you were doing two hours in, with slightly more variation tossed in every now and then. Along with finding upgrades and equipment along the way, there’s plenty of townspeople that you find every now and then trapped in cages. Releasing them sends them back up to the town, usually with some sort of shop or service being offered in the process, and also unlocks a new sidequest to take on that expands on the service they offer. For example, unlocking the blacksmith lets you buy weapons and equipment in the town, while also unlocking a sidequest in which you must find his father’s hammer somewhere in the mine. Once that’s delivered, the blacksmith can then forge brand new equipment out of materials you’ve been collecting from monster drops on your adventure. The town then acts as a tangible metric of progress that you don’t necessarily get when exploring the poorly-paced segments of the dungeon; even if it doesn’t feel like your character is changing very much from hour to hour, having a gradually more populated town does add that much-needed sense of burgeoning power. Luckily, Chasm’s combat is rock-solid (even if not very original), and this goes a long way towards making that moment-to-moment gameplay fun. Chasm directly apes the combat system of the seminal Castlevania: Symphony of the Night, centring strongly around RPG elements and quick, melee-focused tussles. Your right-hand weapon is your primary damage dealer, and there’s a wide array of swords, lances, clubs, and more to choose from, each with their own animations to cater to each playstyle. If you’d like something that’s quick and dirty, a knife is your best option, while a claymore would be a better choice if you want something more powerful at the cost of speed. Your left-hand weapon is there as a secondary choice to supplement your offensive strategy, with each one being a generally smaller consumable projectile that uses a little bit of MP with each use. Throwing knives, molotovs, and hatchets are your bread and butter here, and these can be conveniently sifted through with the shoulder buttons mid-battle. There’s a tight rhythm to combat, which makes each encounter fun. A quick tap of ‘X’ will trigger an instant backdash which can quickly get your character out of the immediate range of an enemy attack. As you battle enemies, you’ll come to understand their ‘tells’ better, knowing when to better time a jump or backdash as you see the wind-up animation start, something which adds a more abstract sense of ‘exp’ on top of the numeric value your character gets after each kill. There are no skill trees or gating in terms of levelling up, but getting enough kills will see your character getting regular stat bumps that come in handy when exploring latter portions of Chasm. These stats can also be supplemented by your equipment, which can be obtained in town or in the mine somewhere, allowing you some autonomy in the kind of build you want to pursue. 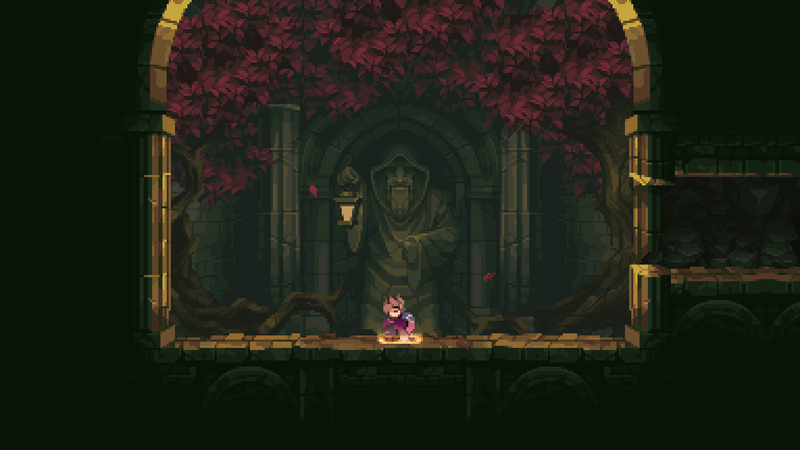 From a presentation perspective, Chasm manages to impress, with some top quality pixel visuals that feature some of the finest animation we’ve seen in a title of this ilk so far. It’s the attention to detail in places where it’s not necessary that this quality is most felt; for example, in one room in the town tavern, there’s a tiny fishbowl on a desk with a well-animated goldfish, seaweed, and a mini-castle. The room would’ve been perfectly fine without it, but it adds that extra bit of character that helps to make it all the more memorable. This eye for detail extends to every bit of Chasm; though the designs of each area aren’t particularly original, each one is gorgeously well-realized. Multiple scrolling layers in the background add a substantial amount of depth and life to each environment, while the movement of each enemy and character has a surprising amount of frames in each animation, lending things a buttery-smooth and organic look. The same couldn’t be said about the soundtrack, which is rather inconsistent and forgettable. The relaxing acoustic guitar theme that plays in the town is a highlight, with a certain nostalgic and quiet quality to it, but the majority of the music down in the mines can be repetitive. There’s not a lot of variation, with plenty of thundering, ominous tracks to set the atmosphere, but after repeated listens of the same track in one area, it gets grating at worst and unnoticeable at best. As for replayability, subsequent runs are obviously different each time, and you can modify the difficulty by adding in a permadeath option that wipes your save if you die, raising the stakes substantially. Along with this, there’s a series of in-game achievements that are unlocked along the run, rewarding you for killing certain enemies or clearing runs in a certain way. 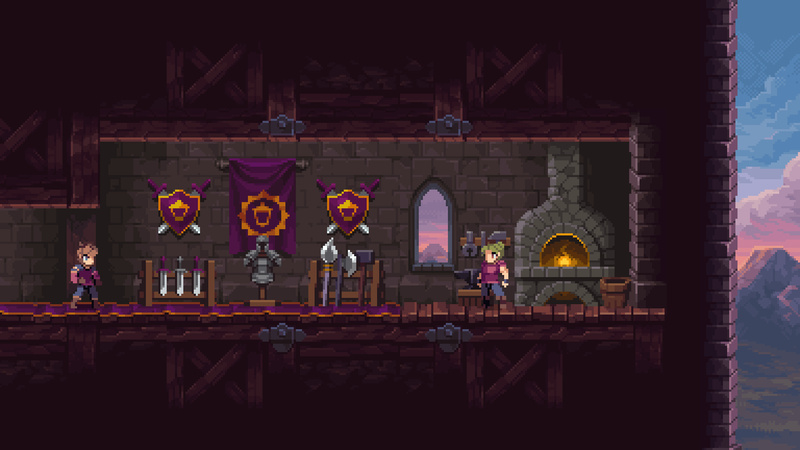 A typical run through Chasm should last you somewhere in the realm of ten to fifteen hours, but the hook here is that doing it again means that most items and collectables are in a different place, making it feel like a new game in many ways. 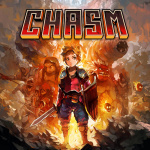 Chasm is a fascinating, mechanically sound take on the Metroidvania genre, but it also fails to do anything innovative or original that hasn’t been done before in the genre, apart from the relatively minor hook of procedurally-generated worlds. Despite this, it’s still a fun side-scrolling adventure that’s sure to be worth your time, with challenging combat, fantastic graphics, and a cool premise all combining to make for a release that we’d recommend to fans of the genre - although there are better examples out there, many of which are on Switch right now. I'm interested, this will go to my growing wishlist. My problem with games that are procedurally generated is if they don't give you a reason to keep coming back. Games like Spelunky solve this by just making the game hard so you HAVE to come back. Deadcells is the same way. This game though, the only thing supposedly keeping you coming back to play again is to experience the same thing as before but in a slightly different order. In order for that to work, the game has to be absolutely steller... which... This review doesn't seem to present it as. Still, looks like a good game, just not sure of the randomness was handled in the best way. Those are my initial thoughts, anyway. One of my biggest disappointment of 2018. I really like!! I will give it a try! It looks pretty, but I seriously doubt Metroidvania and procedual generation should go hand in hand. Also when I first saw it in the eShop I was actually reminded of game Chasm: The Rift, even though it has nothing to do with it (that was a Quake-like FPS). It is a soild good fun game I would give it a 8 outta 10 . The reviewer is pretty much spot on , good review., It could have been a better game in small areas. I think games like these need that something more like online leaderboards or co-op play something to give players a little more engagement . Still though it is a fun game . So basically... "do you desperately want a Rogue Legacy that's different and not as good as Rogue Legacy"? And considering I still replay Rogue Legacy.... sounds like a pass. I love how reviews always trash on procedurely generated with comments like forgettable rooms...but it’s not like every single room in metroid is so awesome. It has boring tedious parts where you run lost through the same areas all the time. Isn’t that kinda the point to a Metroidvania? Admittedly, the only game I’ve ever really gotten into has been binding of Isaac, and it’s procedurely generated boring levels hasn’t stopped me from enjoying near 200 hours of it on my switch/3ds/Wii u.
I don’t have dead cells yet either, if it ever goes on sale. I’ve stopped paying full price for most games since my backlog is too long as it is. The only procedurally generated game I've ever loved is Spelunky. And it not only works there but is invaluable to the game design, since you can and do restart the game multiple times per hour, especially in the beginning. I'm not sure what the point is here. How many players will ever play twice , let alone multiple times? Seems like a huge waste of effort that could have been spent elsewhere. Think I'm gonna wait for a sale on this one because I'm playing the excellent Timespinner on ps4 and this sounds to be similar but not as good. Oh.... How I wish Rogue Legacy was available on Switch... I'd replay it again and finish it gladly for the... I think... fifth time... or so... One of my favorite game ever. Never get tired of it. Bought it on PC, on PSN... would rebuy it on Switch if available. I remember playing the demo for this on PS4 a few years ago and really enjoying it. But my favorite part about metroidvanias is how their integrated worlds can lead to thoughtfully created and impactful set pieces, which obviously cannot be maintained when the whole game is procedurally generated. It's a shame Chasm couldn't find a way to strike some sort of balance. 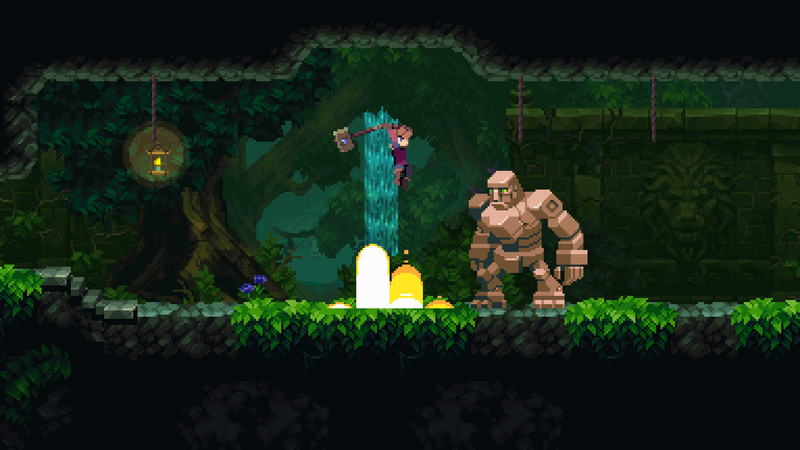 The "Metroidvania" genre is pretty much defined by smart and thoughtful level design. A Metroidvania with procedurally-generated levels makes as much sense as a book with procedurally-generated sentences. If there is any other "Metroidvania" game you haven't played yet, I suggest playing that instead. Because the world is randomly generated there is no feeling of cohesiveness that others in the genre have. This game is also extremely repetitive with its rooms. Really easy to notice in late game. I suggest looking up reviews on youtube before buying. This game looks alright. But it manages to hit two of my personal dislikes in recent game design. A game visually designed to look old school but isn't actually retro, and procedural generation. I like pixel-art and sprites in games, I like it a lot. It can be done really well. Games like Octopath Traveller from a major studio, or indie titles like Stardew Valley and Iconoclast look great! Buuuut... A lot of these wannabe retro indie titles almost look deliberately lazy to me. Like they choose the style less as an asethetic choice, and more out of bandwagon, fad chasing. It's not a fair judgement on my part, but it's the feel I get. I'm also not too fond of procedural generation, for reasons this review touches upon and others. I have yet to play a game that is procedurally generated that can mimic the feel of lovingly crafted game design. It can still work very well, but the feeling isn't the same. I've heard bad things about this, and from what i understood it was supposed to be an exclusive. Guess it didn't sell well and they had to put it other places lol. @Heavyarms55 Looking at all of the animation work in this though, the art is definitely not a lazy effort. 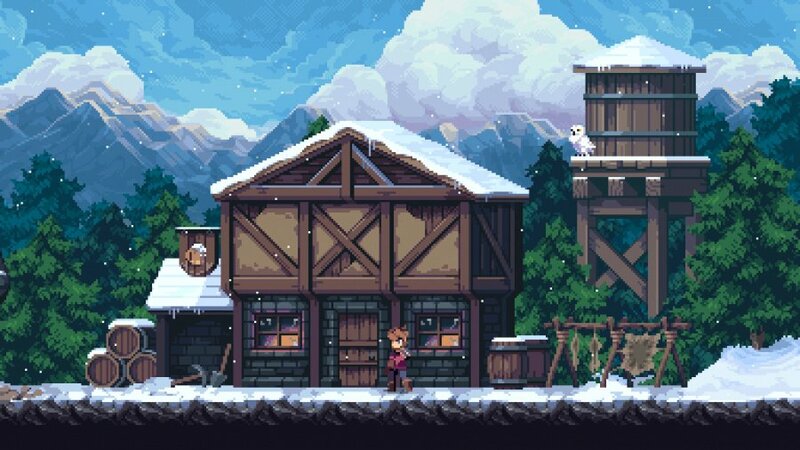 This is absolutely one of the games that I would say does pixel art very well. Another wishlist title but unlike some of the recent Metroidvania's not a "I have to play this now!" title. Combat is rock-solid? I found it pretty annoying. But average score of 7/10 is ok, it's good but nothing special. Like to have physical version as well. I have Dead Cells & Wizard of Legend. I mostly play WoL still because magic and multiplayer. Dead Cells, I've slowly started playing less and less, and don't want to buy a game like either of these for the moment. Would these be important factors on deciding whether or not to get this game? The art style looks really good but procedurally generated... No, thank you! A Robot Named Fight does a great job as a procedural generated Super Metroid, and a run will clock in under 2 hours. Quick pick-ups, no dead time. If being less careful, it can go faster. Shame since the art style is absolutely top tier. @SuperCharlie78 I have and still went back to binding. It plays a lot slicker, but i just couldn’t get into it like binding. Sounds like something I can comfortably pass on. It has some nice visuals, and at least perma-death is an option rather than treated like some sort of feature, but it doesn't do anything to wow me at all. And any procedural generation is generally a bad thing. I played this game on Steam and like many others have said, the randomly generated rooms are a waste on a game of this genre. It also does very little to separate itself from Castlevania. I'm fine with it having similar mechanics but this is just a complete clone. Please stop with these procedurally generated games. Please stop witht these low-quality 2D pixel games. Stop with the Metroidvanias. The Switch is utterly inundated with these types of games, and I have gotten bored with them. I won't even get Dead Cells, which seems to be the best of them because I've played three thousand other games like it on Switch. Too bad it's merely good. Was super hyped for this when I saw a trailer for it on PS4 in what must've been 2015 or 2016.... Love the look of this but as it continued to get delayed I started to simply forget about it. I honestly didn't know it was even coming to Switch. As an aside... I remember when we longed for anything resembling Metroid or Castlevania... Based on the comments, I think we've had our fill for awhile. I find it funny that there are clearly a good number of comments here from people who haven't read the review. The rooms themselves aren't procedurally generated, they were designed by the devs and permadeath is only an option you can enable. @dougphisig it actually wasn’t going to be an exclusive. It was just a kickstarter game that only planned to develop for one system. Switch functionality was set sometime in between its development but was told would come a bit after release. I think the reviews are a bit too harsh. I’ve been a backer of this from day 2 and honestly the game was EXACTLY what the developers wanted to give us, a game that plays almost EXATCTLY like a mix of SOTN and Metroid, with generated dungeons to make the game cheaper to develop(remember this was mad by a handful of devs on a relatively small budget), AND THEY SUCCEEDED in that. The devs never over promised or under delivered. I’m telling you this game is a love letter to SOTN and anyone who’s a fan needs to play it on hard mode. It plays pretty much exactly like it and 60-70 hours later I know I got my money’s worth. DO NOT let these reviewers make you think this is a bad game. It’s not. I don't understand why a game like this would be procedurally generated. It's better to actually design the world, build the puzzles into it - and not have the hassle of designing and testing the world randomisation system. I’m still buying this. I was so happy to hear it arriving on Switch. It reads like an 8 here and that tried and true formula done right can’t be beat. It seems like it was done right here. It’s funny. What you mention about the music I feel is exactly how I felt with Axiom Verge’s. That first areas music is unforgettable. All else after is meh. On the one hand, I generally think its take on procedural generation is novel and far and above an improvement over what most Rogue-likes try to do, by making important parts of the game static so the game's progression and balance don't suffer. ...But if I'm being honest, they should've just stuck with designing the entire map themselves. It probably would've been less work, and they'd have an even better game because of it. @Oat I think part of the cost being so high sometimes is just to capitalize on peoples impatientness and then rest of us can wait for a sale. Hyper light drifter is another I am waiting for a sale to get. @SuperCharlie78 I second this, Enter the Gungeon is the perfect example of a roguelike done right. Looks great but hard pass, generated worlds become boring very quickly. I love the game. And I'm happy that it gets the attention it deserves on Switch. Good sales mean, that the developer will probably make a sequel and work on the flaws of the first game. This game is absolutely amazing, I agree with some of the others about the review...this game seems to be polarizing but don’t let some of the less-than-great reviews deter you, Chasm is stunning and it’s swiftly becoming a favorite in the genre. @Cobalt ironically I'm in the opposite situation. The fact that it's slower than other similar games is actually what made it appealing to me, especially when playing some of the side scrolling dark soul lite of Hollow Knight. Rogue Legacy is still very much roguelike hard ontop of having permadeath. This doesn't even have permadeath. This actually has more on common with Symphony of the Night, especially the variety of weapons, even including a lot of the moves like the backdash dodge and so on. To a degree, that it feels like a game I actually can complete(from playing it on my Switch so far) is part of the appeal. And sure I could play Symphony of the Night who's likely a larger game/etc but that would require me having the game AND a console to play it on. Plus in terms of more minor features I do like the hub town that increasingly get populated with villagers as you gradually free them, giving you a quiet space of "normal" to retreat back to from one of these many shortcuts in the dungeons. It's quite a change from being trapped in a cursed castle all the time. @MeloMan ironically there isn't even permadeath afaik and the procedural generation is very mild... a LOT of the rooms very much remain handcrafted and all that changes is their position on their floor and connection hallways really. @Cathousemaster from what it sounds like w from a backer here , it mostly came to studio size. Procedurally generating some of the layout was a way to offload some of the work. At the same time it's not a full procedural generation as a lot of the room are very much handcrafted so it's specifically some of the connector hallways and shafts that are generated really. Many times I forgot the thing had procedural generation at all. In practice the thing really play like Symphony of the Night if you like Metroidvania games but find games like Hollow Knight or Dandara too hard to get into(my case sadly). And since SoN is unlikely to get a Switch release anytime soon(not everyone gets to own a console it can be played on), this is the next best option in my opinion. I do like the variety of weapons that is found here as well. It's something I missed a lot in other metroidvania games that force you to use the same primary weapon throughout the entire game(unlike this one as said where I can easily choose from clubs, swords , spears and axes ontop of spells). @Fake-E-Lee ironically while some claim it stick TOO close to Symphony of the Night that's actually came to be part of the appeal for me as it features a pace asks more relaxed(but still featuring some challenge) style of play that ironically seem very scarce despite all the metroidvania games out there. Just the fact the character can equip more than a single type of primary weapon feel like a breath of fresh air compared to all the other games where you can't change your main weapon ever. Like my dad had been paying and being Faxanadu even just a few years ago thanks to the wiiware eshop version and that game feels like something he could play unlike something like Shovel Knight which I'm not too sure about.